BETONOX Construction Sopot specializes in commercial, residential, office and industrial building services, both “turnkey” in the General Contractor, as well as in constructing complex concrete structures of these objects. Our company carries out the maintenance of buildings and construction of railway infrastructure, platforms, ramps, railway control room, engineering facilities and crossings. 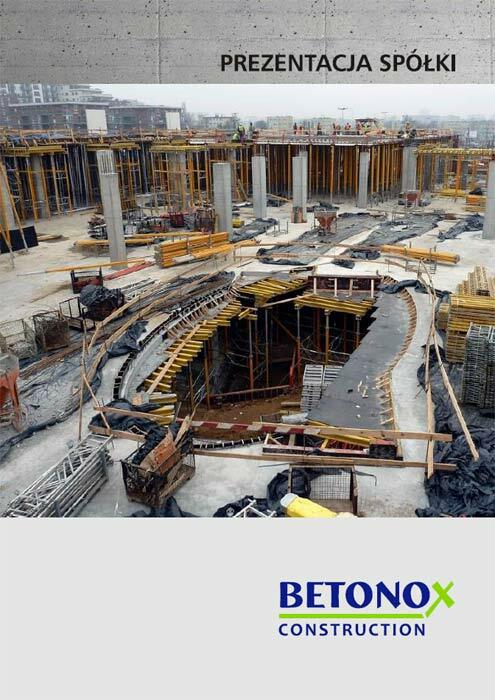 BETONOX Construction Sopot is a company derived from BETONOX Building Group, which was founded in the first quarter of 1998 and is now the backbone of the capital group, which consists of companies engaged in specialized construction services. BETONOX Construction Sopot is a rapidly growing company that employs an experienced management team, so that we can ensure the effective organization of work and diligence of performance is made possible by the commitment of the team of professionals with many years of experience in the construction industry. The activities of the company are carried out with the use of modern equipment, the latest technology and the highest quality materials sourced from proven suppliers. All these factors make it possible to adjust the scope of our services to the individual needs and the requirements of our customers. Our priority is the investment performance at the highest level within the scheduled dates.